Meet Effie, my new pet. Effie is water kefir grains from Cultures for Health and yes, she most definitely is alive. Effie consists of lactic acid bacteria and yeast living happily together. She eats sugar and makes a yummy fizzy beverage very similar in benefits to milk kefir. The only reason I keep white sugar in the house is to feed Effie. Effie is actually my 3rd water kefir pet. The first accidentally got cooked in the oven (that’s where I kept her warm but I forgot to take her out when I turned the oven on). The second died as a result of neglect. After our house flooded I just forgot about her and after about 6 weeks, she was gone. So our new Effie came in the mail today and is sitting happily on our counter rehydrating and in a few days we’ll be able to enjoy this natural soda again. By the way Effie is short for Effervescent. You might need to warm the water up a bit to get the sugar to dissolve. Allow to cool to room temperature. Add 1-2 tbsp worth of kefir to the sugar/water mixture. Effie likes minerals so if you want to add a dab of molasses or a few pieces of egg shell, that would make her happy. We have well-water so she gets plenty here. Let Effie set loosely covered (I use a coffee filter) for 24-48 hrs. The longer she sets, the more sugar she consumes and the less sweet your kefir will be. You should notice bubbles rising to the surface. 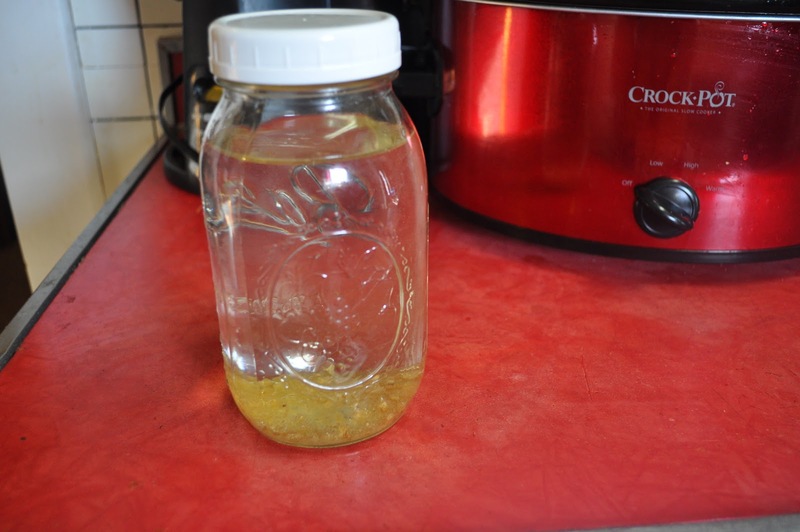 Strain Effie from the sugar water and you can either start another batch or put her in a jar of water and store in the fridge for up to about a week. She needs to be fed after a week. Now you can either consume the water kefir as is or turn it into a fizzy “soda”. To make her really fizzy and tasty, we’ll add juice and let set overnight, tightly contained. I usually add about 1 part juice to 4 parts kefir but you can adjust the ratio to taste. Orange juice is my favorite. Until I can get my hands on some Grolsch Flip Top Bottles, I just use old apple cider vinegar bottles and screw the cap on tight. Don’t forget your juice kefir! If you let it set too long during the second fermentation, you might get an eruption.